Engagement and planning to guide community and private development for a historic town center. Uptown Westerville represents one of the best preserved and successful historic downtowns in Central Ohio. The vibrant and rich history of the community is apparent in the character of the buildings, the inviting streetscapes, and the mixture of civic, retail, and residential land uses. 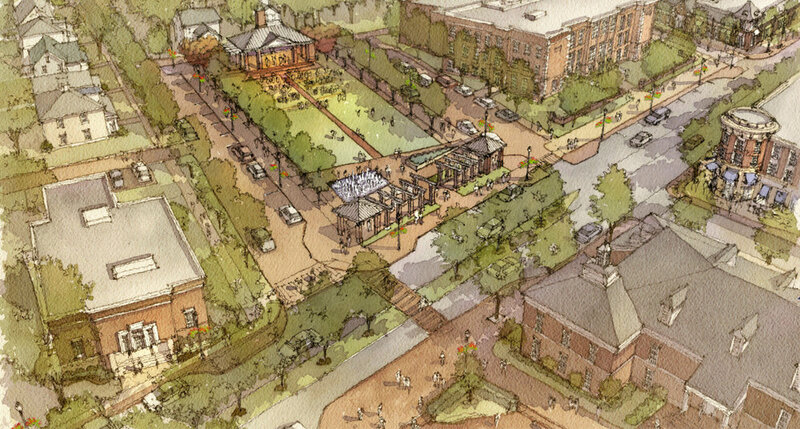 MKSK led the Uptown Westerville Comprehensive planning process to create a guiding document for this historic downtown that builds upon its authenticity, creating a framework for the implementation of catalytic projects that match the community’s vision for Uptown. Public input was integral in defining the vision for Uptown. The comprehensive planning process was guided by a steering committee of residents, property owners, and business owners. Numerous public open houses were held where Westerville residents and stakeholders discussed what they saw as opportunities and challenges for the Uptown. An interactive public website also provided a digital platform for public engagement and additional community discussion .Through this process, nine catalytic projects were identified. These included streetscape improvements, parking recommendations, capitalizing on the historic alley system and pedestrian connections, creating a new community civic space, planning for bicycle connections, activating the historic State Theater, identifying infill development opportunities, and emphasizing gateways into Uptown. Since the completion of the Uptown Plan, MKSK has collaborated with the City of Westerville on several implementation efforts, including the redesign of portions of the Uptown Alley system, identification and design of infill opportunities, and redesign of the South State Street streetscape. MKSK is also part of the planning team working to update the City’s zoning codes to help implement the vision of the Uptown Plan and the Imagine Westerville Comprehensive Plan.